How Do We Learn? The ability to learn is unique to everyone. However, there are specific factors that must first be met. 1. The individual must be ready. 1 How Do We Learn? The ability to learn is unique to everyone. However, there are specific factors that must first be met. 1. The individual must be ready to assimilate new knowledge. 2. 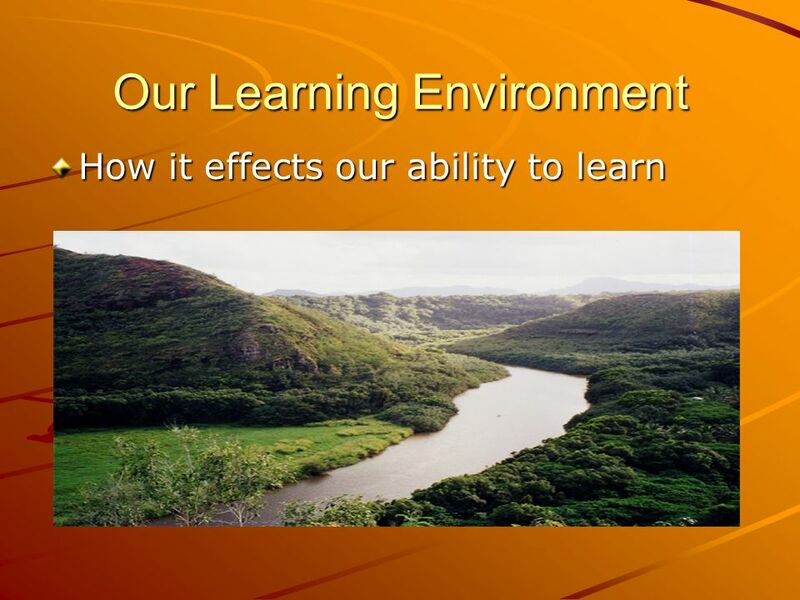 The environment must be conducive to the learner. 3. 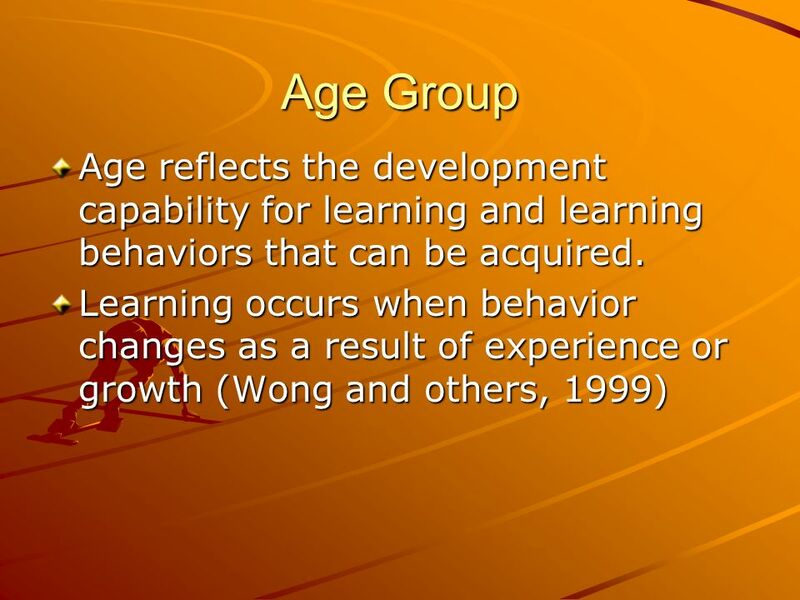 Their learning domain must be identified. 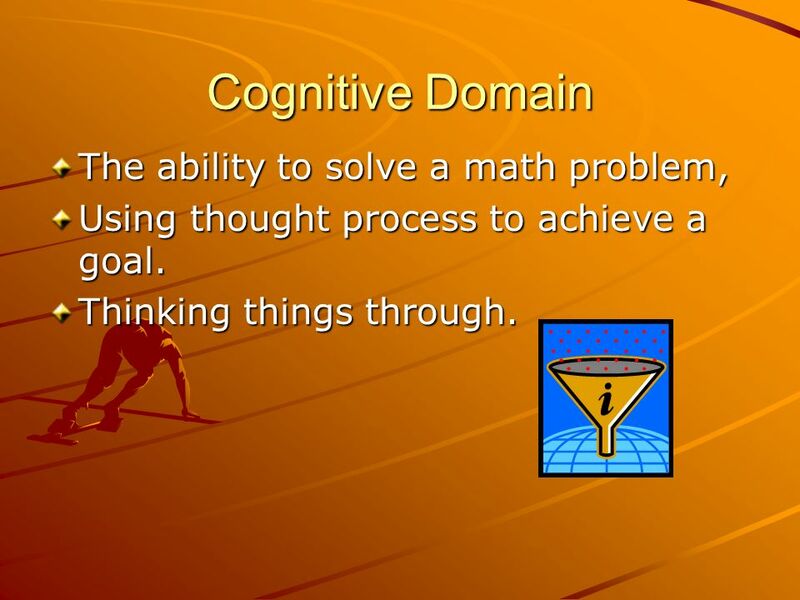 3 Cognitive Domain The ability to solve a math problem, Using thought process to achieve a goal. Thinking things through. 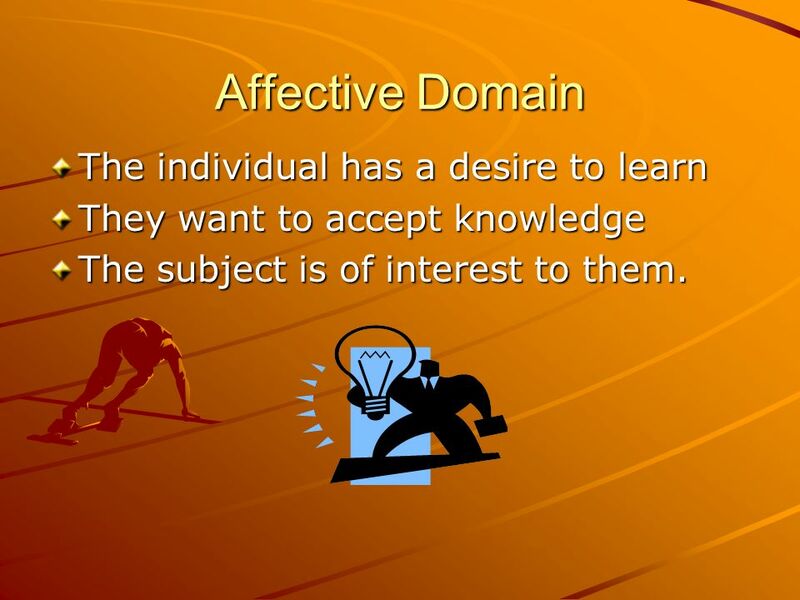 4 Affective Domain The individual has a desire to learn They want to accept knowledge The subject is of interest to them. 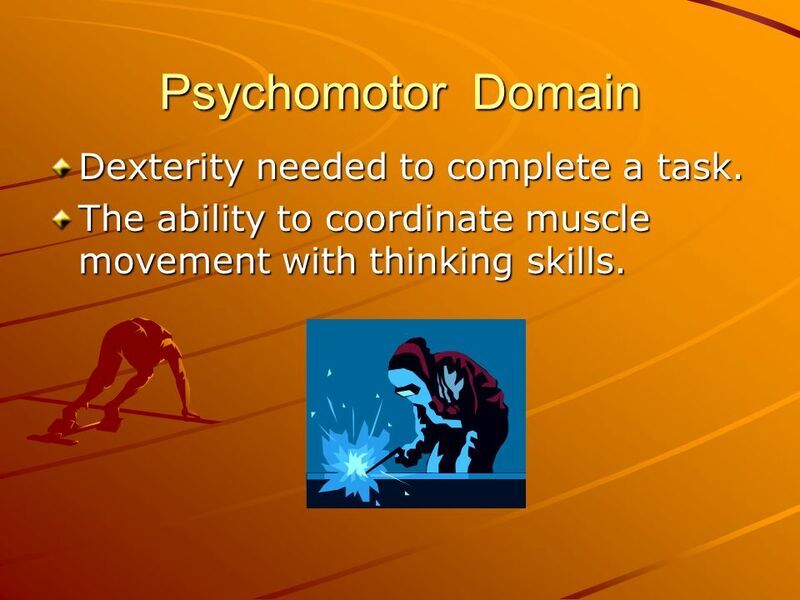 5 Psychomotor Domain Dexterity needed to complete a task. The ability to coordinate muscle movement with thinking skills. 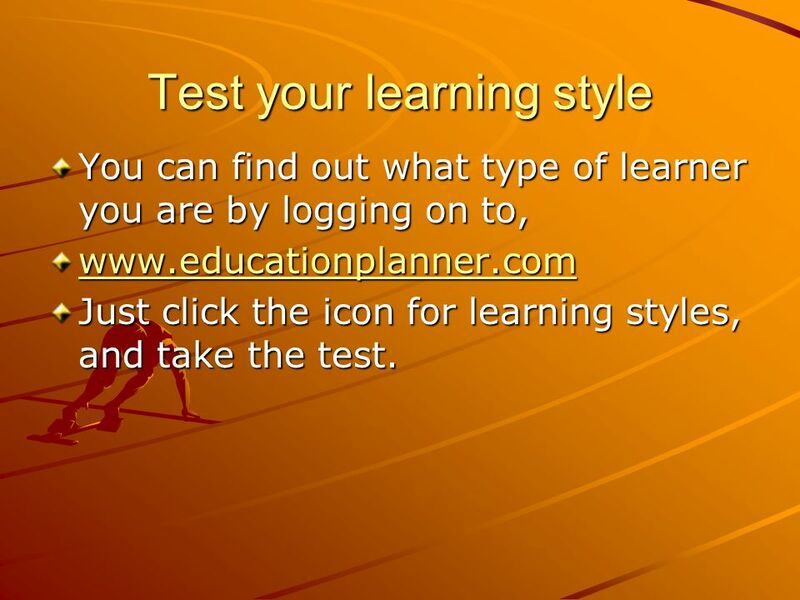 6 Test your learning style You can find out what type of learner you are by logging on to, www.educationplanner.com Just click the icon for learning styles, and take the test. 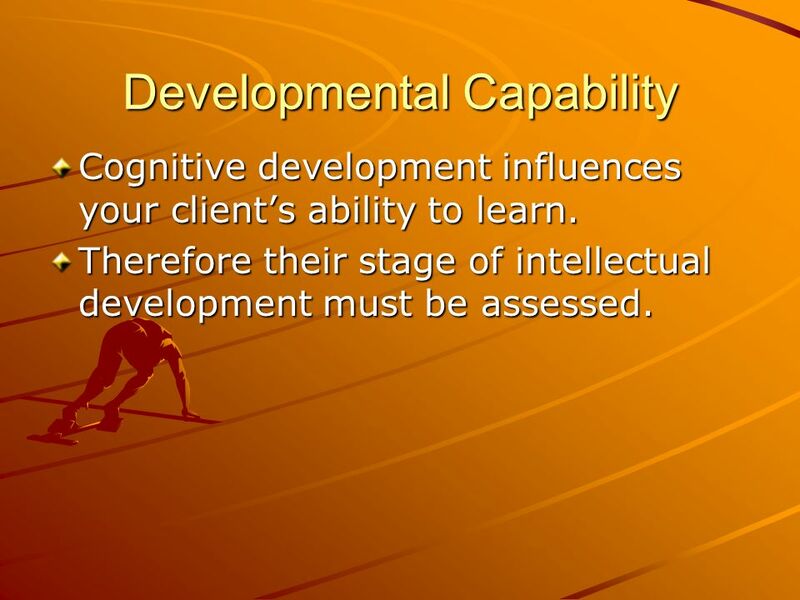 9 Developmental Capability Cognitive development influences your clients ability to learn. Therefore their stage of intellectual development must be assessed. 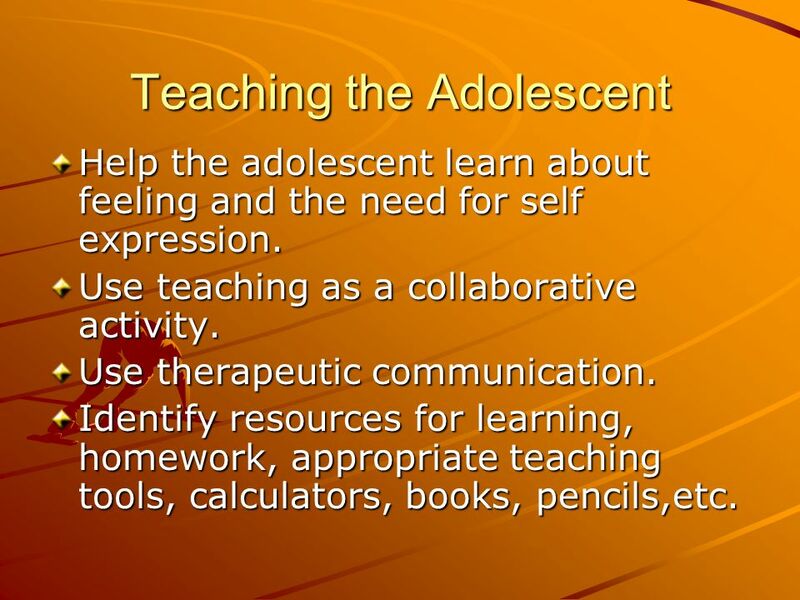 11 Teaching the Adolescent Help the adolescent learn about feeling and the need for self expression. 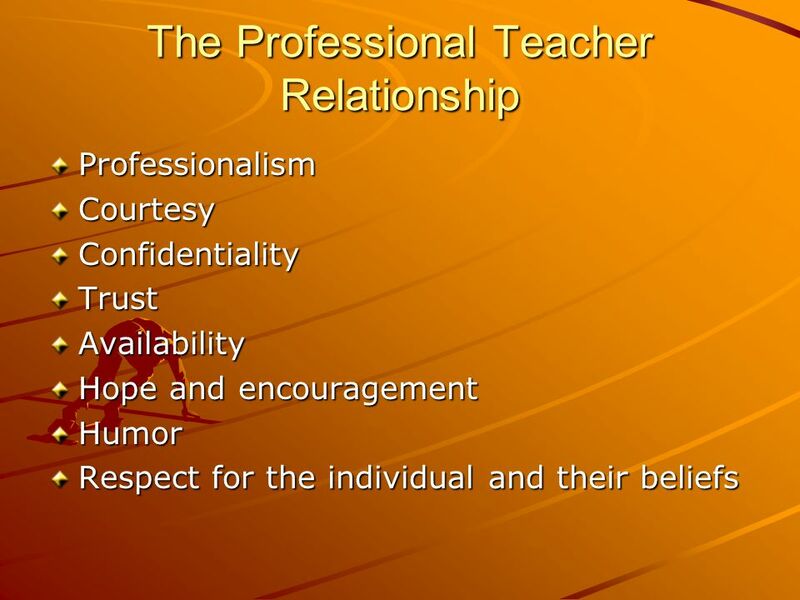 Use teaching as a collaborative activity. Use therapeutic communication. Identify resources for learning, homework, appropriate teaching tools, calculators, books, pencils,etc. 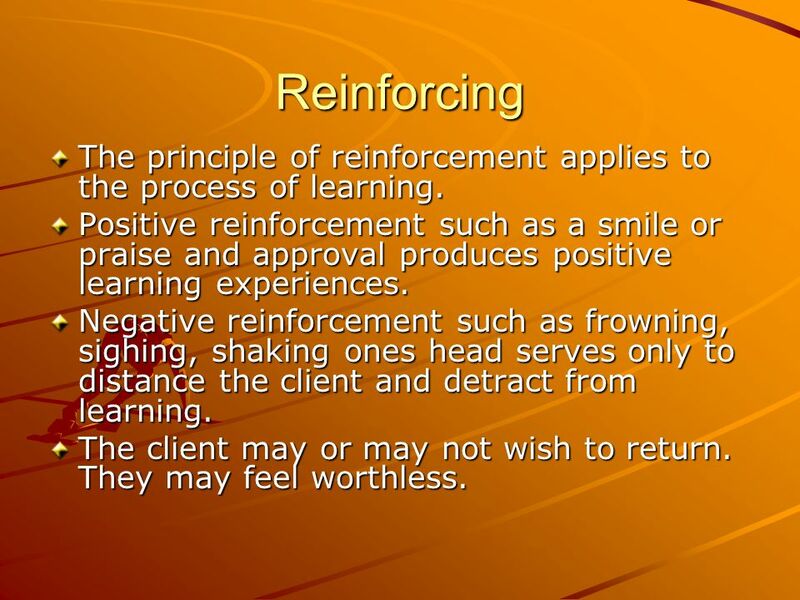 13 Reinforcing The principle of reinforcement applies to the process of learning. 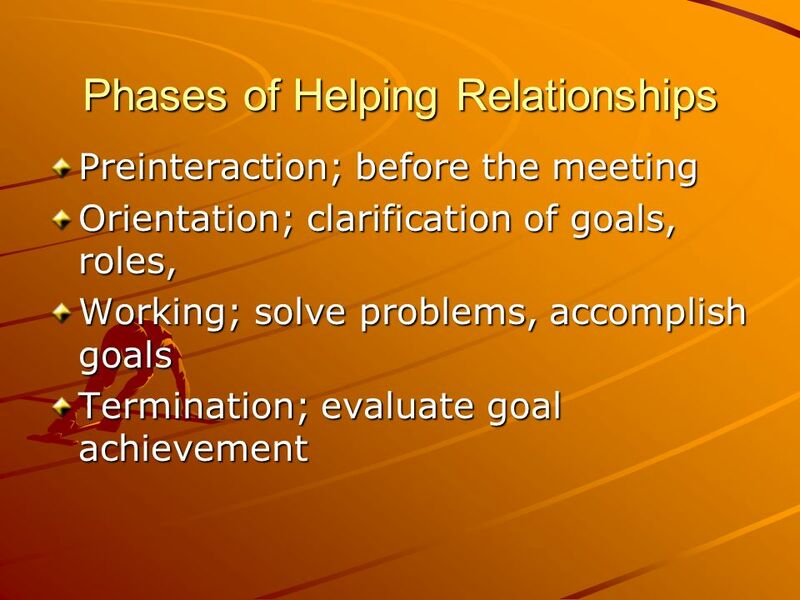 Positive reinforcement such as a smile or praise and approval produces positive learning experiences. Negative reinforcement such as frowning, sighing, shaking ones head serves only to distance the client and detract from learning. The client may or may not wish to return. They may feel worthless. 14 Reinforcement Choosing an appropriate reinforcer involves careful though and attention to individual preferences. 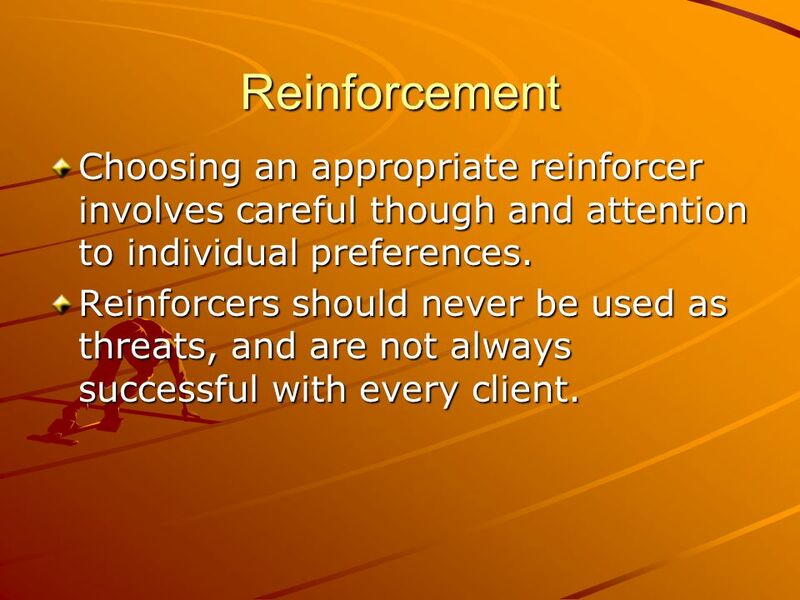 Reinforcers should never be used as threats, and are not always successful with every client. 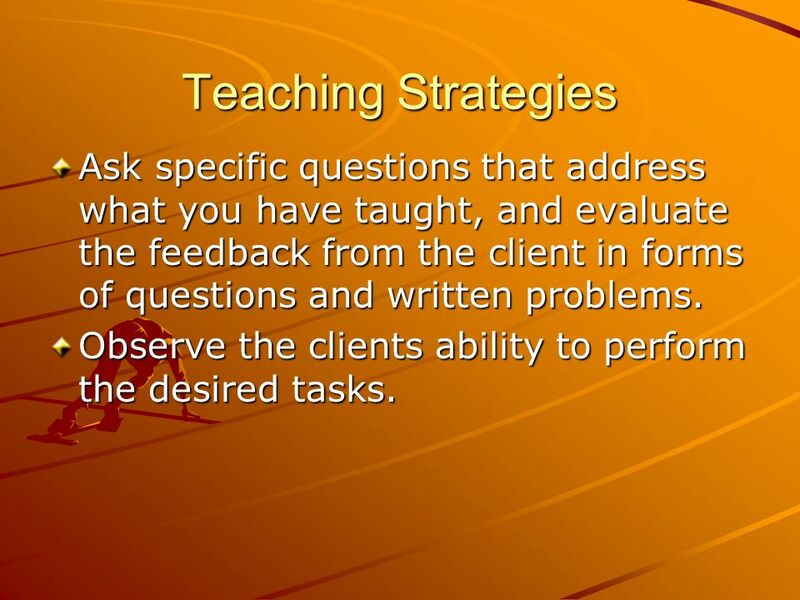 16 Teaching Strategies Ask specific questions that address what you have taught, and evaluate the feedback from the client in forms of questions and written problems. Observe the clients ability to perform the desired tasks. 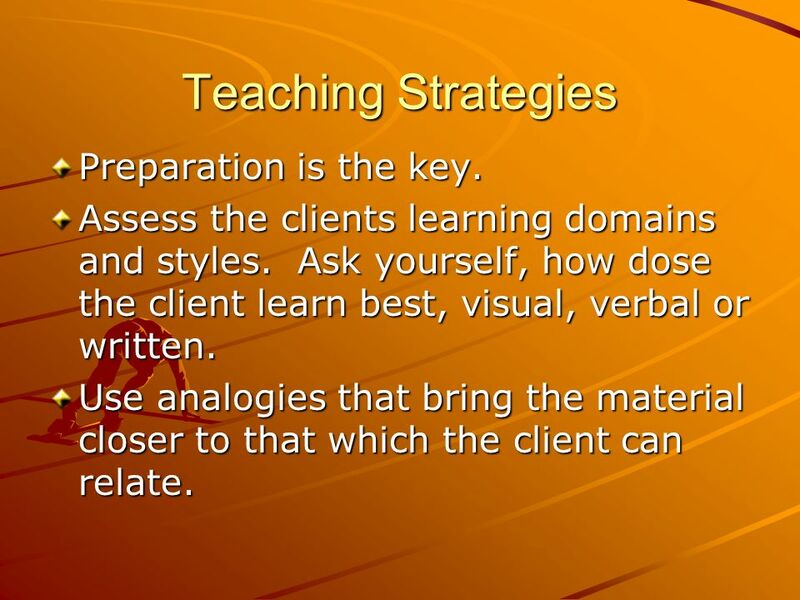 17 Teaching Strategies Preparation is the key. 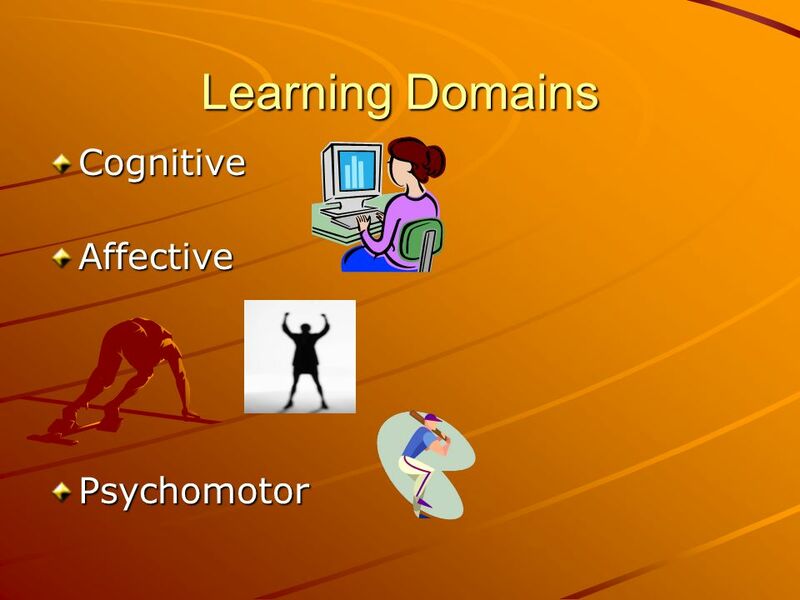 Assess the clients learning domains and styles. Ask yourself, how dose the client learn best, visual, verbal or written. 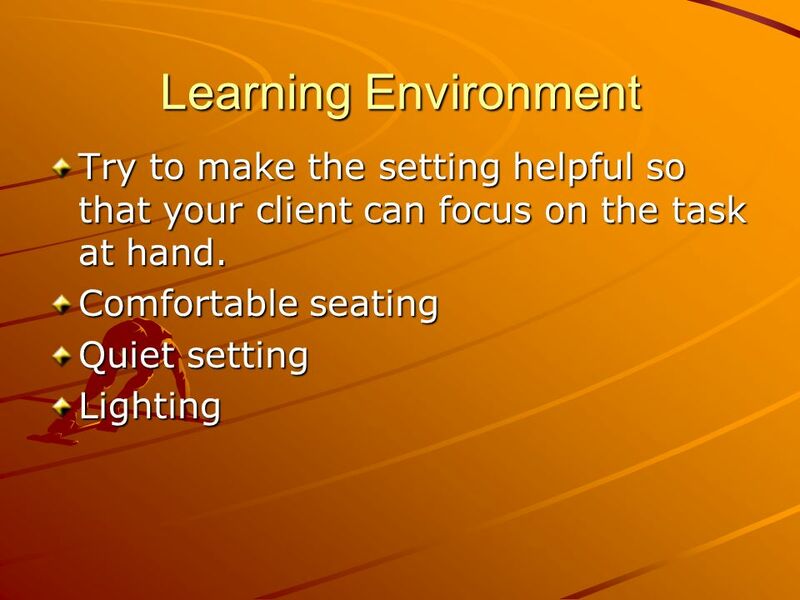 Use analogies that bring the material closer to that which the client can relate. 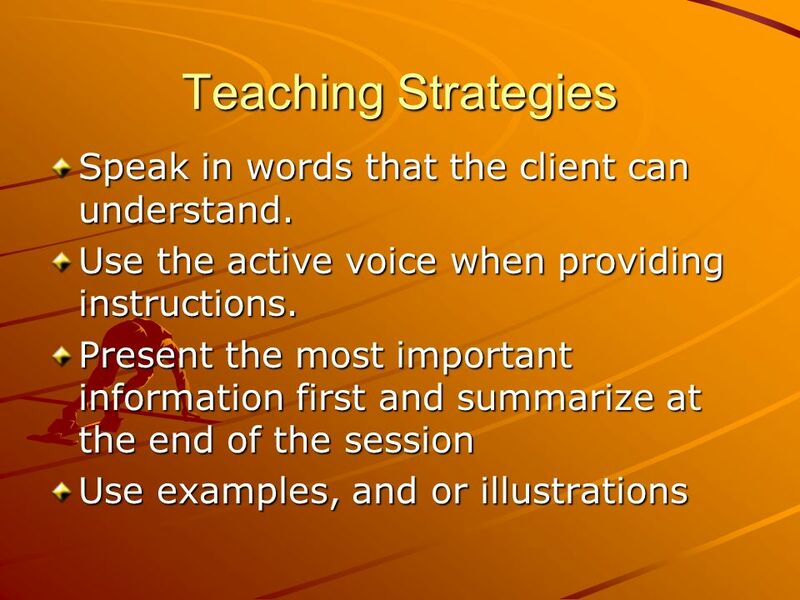 18 Teaching Strategies Maintain attention and participation by adjusting the intonation of your voice when accentuating key points. 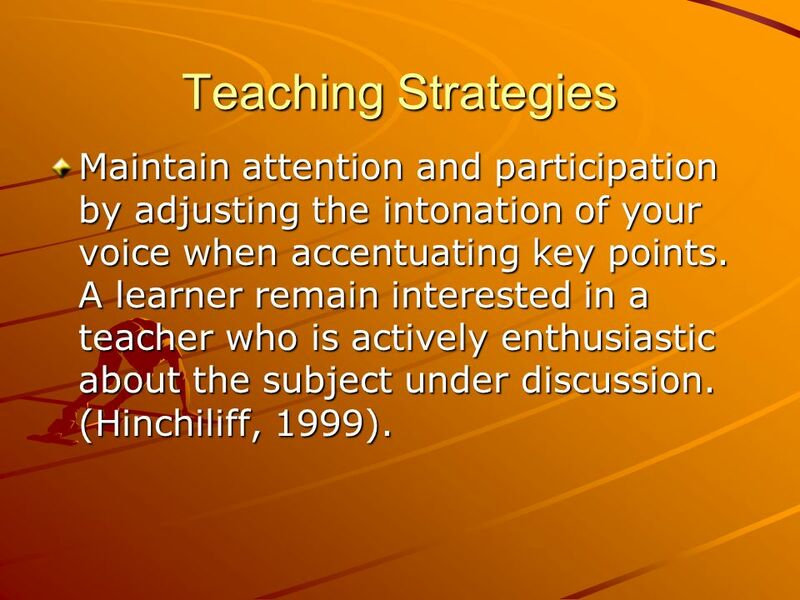 A learner remain interested in a teacher who is actively enthusiastic about the subject under discussion. (Hinchiliff, 1999). 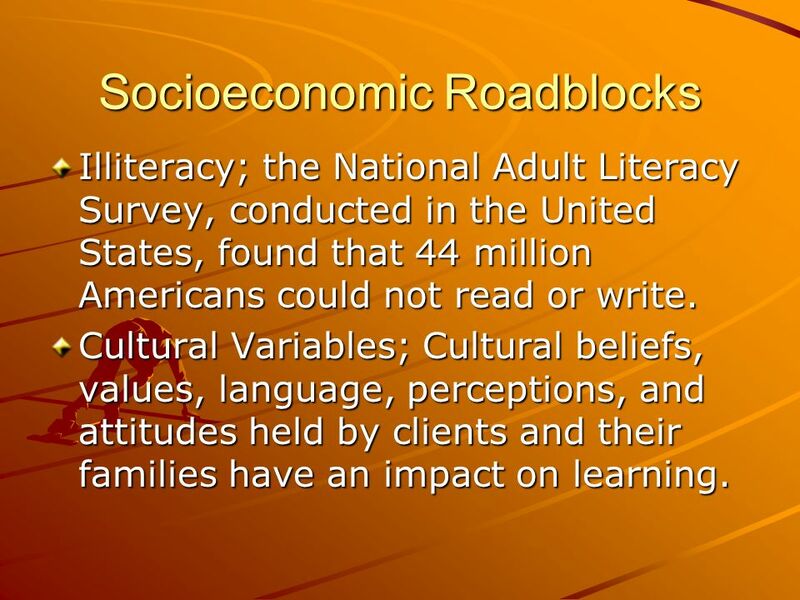 19 Socioeconomic Roadblocks Illiteracy; the National Adult Literacy Survey, conducted in the United States, found that 44 million Americans could not read or write. Cultural Variables; Cultural beliefs, values, language, perceptions, and attitudes held by clients and their families have an impact on learning. 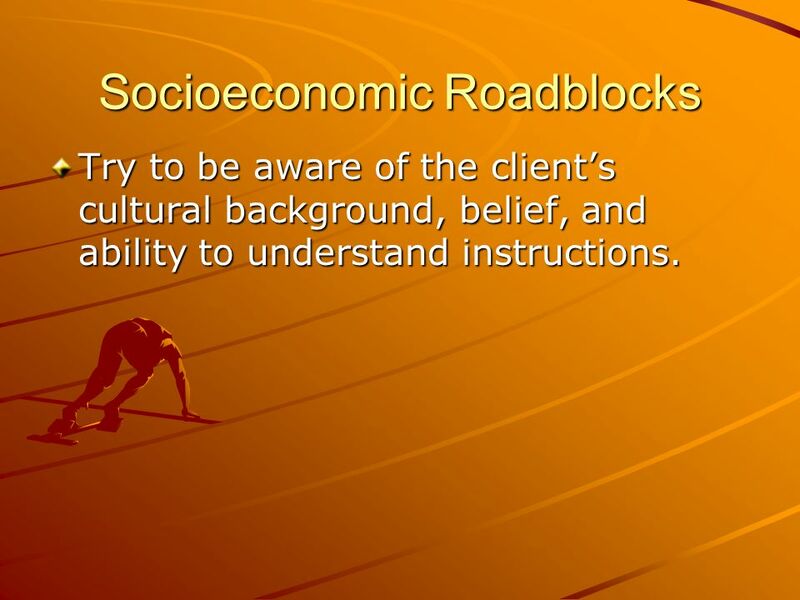 20 Socioeconomic Roadblocks Try to be aware of the clients cultural background, belief, and ability to understand instructions. 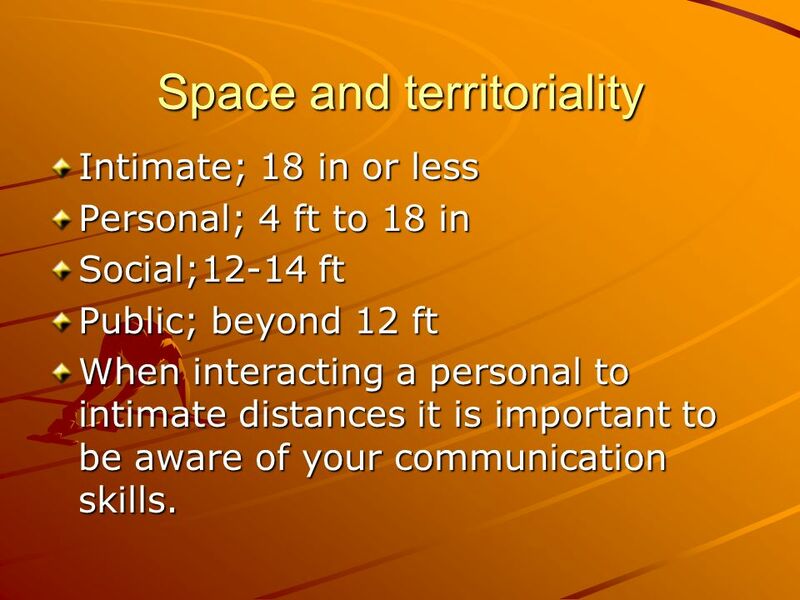 22 Space and territoriality Intimate; 18 in or less Personal; 4 ft to 18 in Social;12-14 ft Public; beyond 12 ft When interacting a personal to intimate distances it is important to be aware of your communication skills. 26 How you can make a difference as a Mentor! 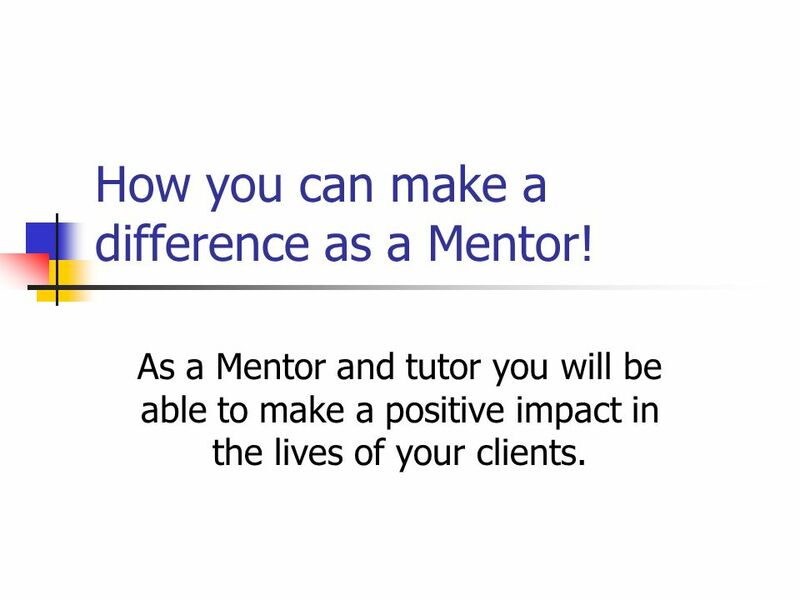 As a Mentor and tutor you will be able to make a positive impact in the lives of your clients. 27 Making a Change The confidence that you can inspire in others will last a lifetime. Many times it will be you, who will be the first line of support. 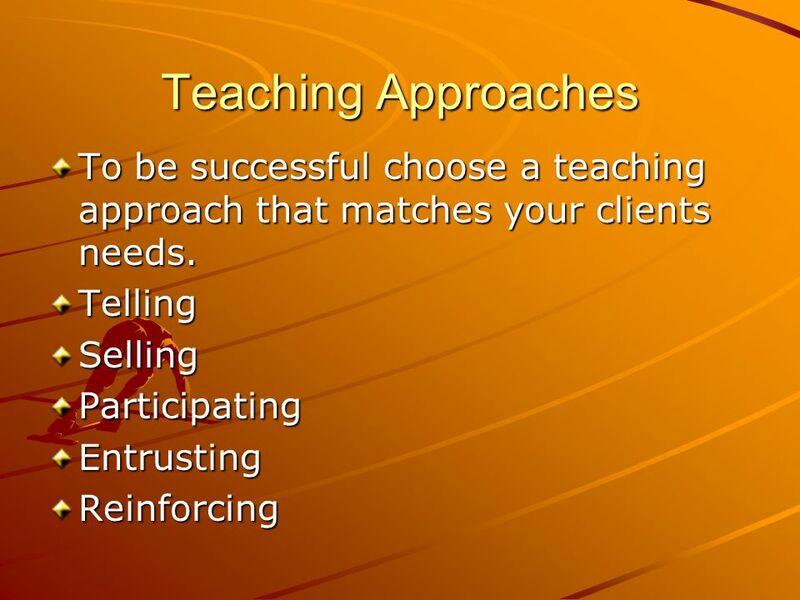 Going in with the right attitude and prepared teaching strategies will help your clients in learning. 28 Be on Time It is a sign of disrespect for your clients and well as for your position when you do not arrive on time. 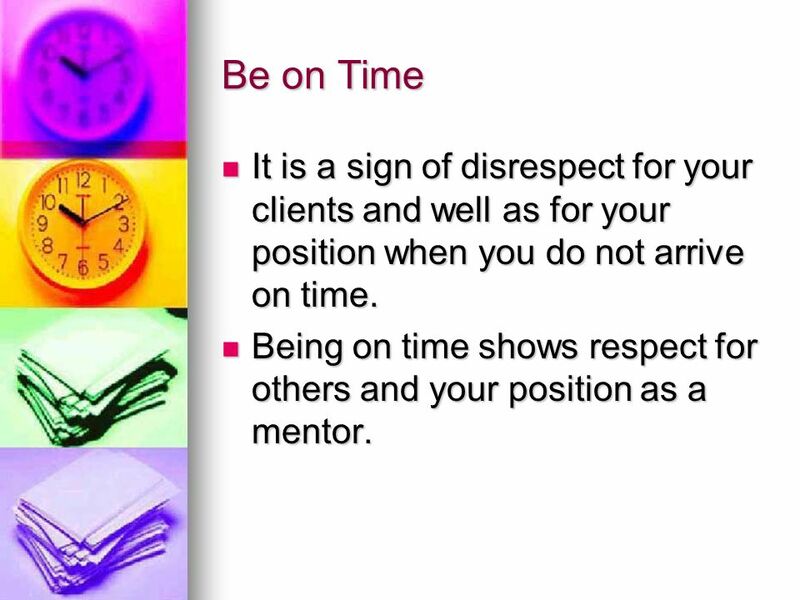 It is a sign of disrespect for your clients and well as for your position when you do not arrive on time. Being on time shows respect for others and your position as a mentor. Being on time shows respect for others and your position as a mentor. 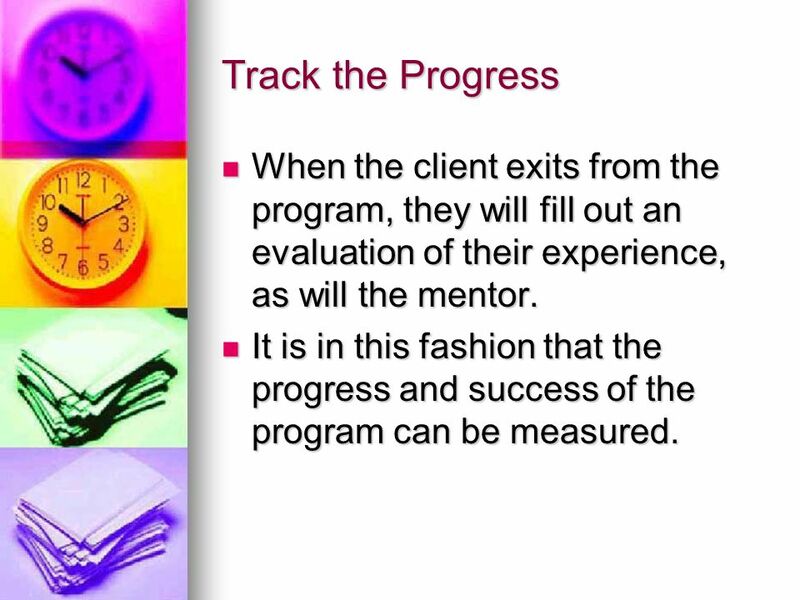 30 Track the Progress When the client exits from the program, they will fill out an evaluation of their experience, as will the mentor. 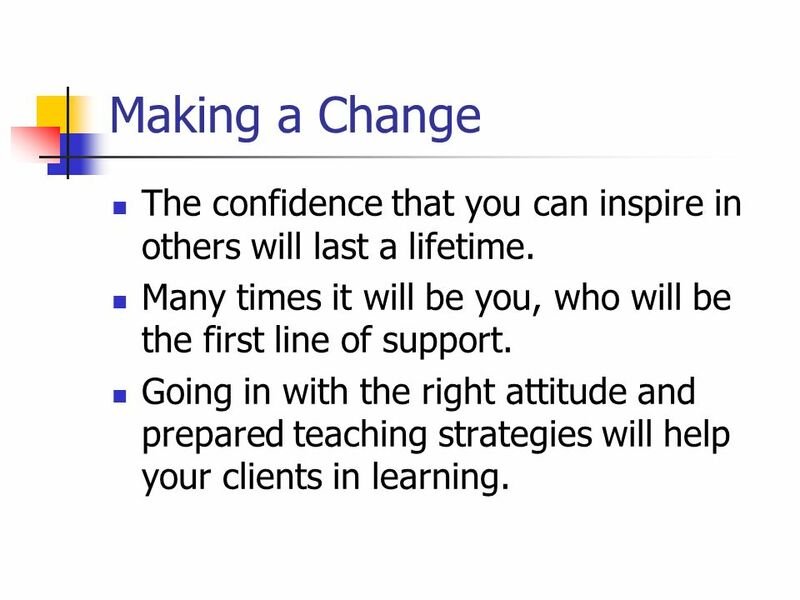 When the client exits from the program, they will fill out an evaluation of their experience, as will the mentor. It is in this fashion that the progress and success of the program can be measured. It is in this fashion that the progress and success of the program can be measured. 31 Tracking Clients will be given a exit exam on the material that they have been tutored on, in collaboration with their instructors. This exam will be either written or online. 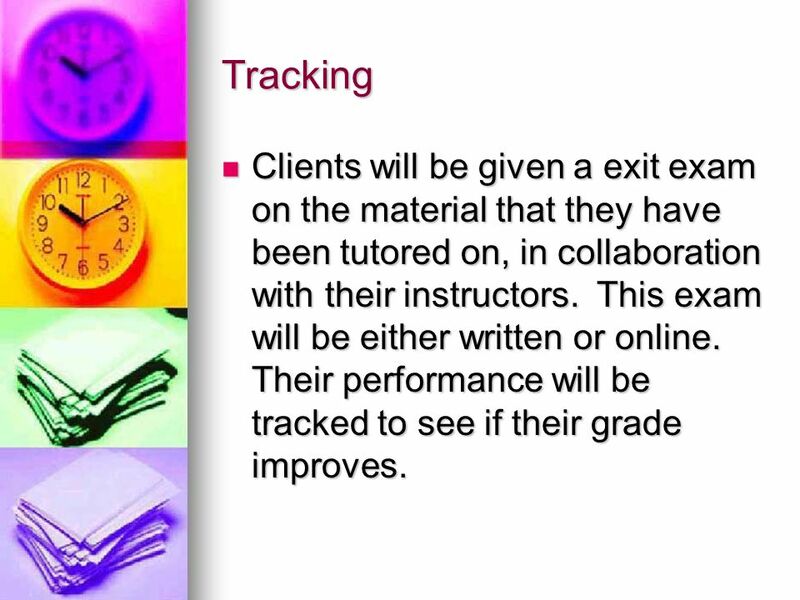 Their performance will be tracked to see if their grade improves. Clients will be given a exit exam on the material that they have been tutored on, in collaboration with their instructors. This exam will be either written or online. Their performance will be tracked to see if their grade improves. 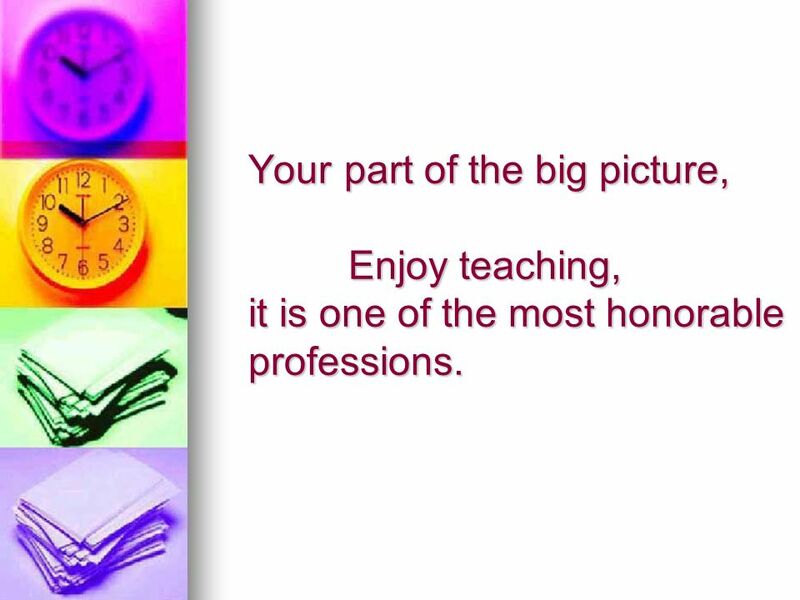 32 Your part of the big picture, Enjoy teaching, it is one of the most honorable professions. 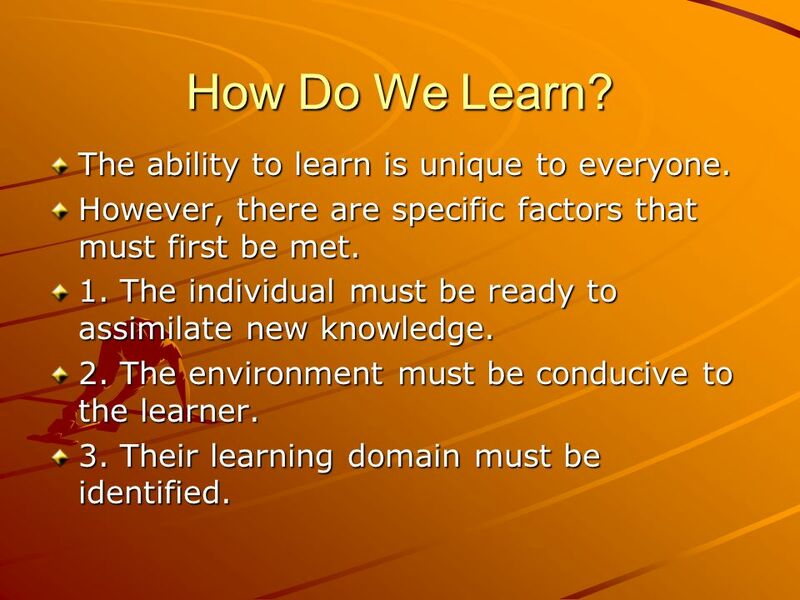 Download ppt "How Do We Learn? The ability to learn is unique to everyone. However, there are specific factors that must first be met. 1. The individual must be ready." Observation & Feedback Core Skills for Teaching Faculty Jan Shorey UAMS Teaching Scholars Program American Academy on Physician & Patient. 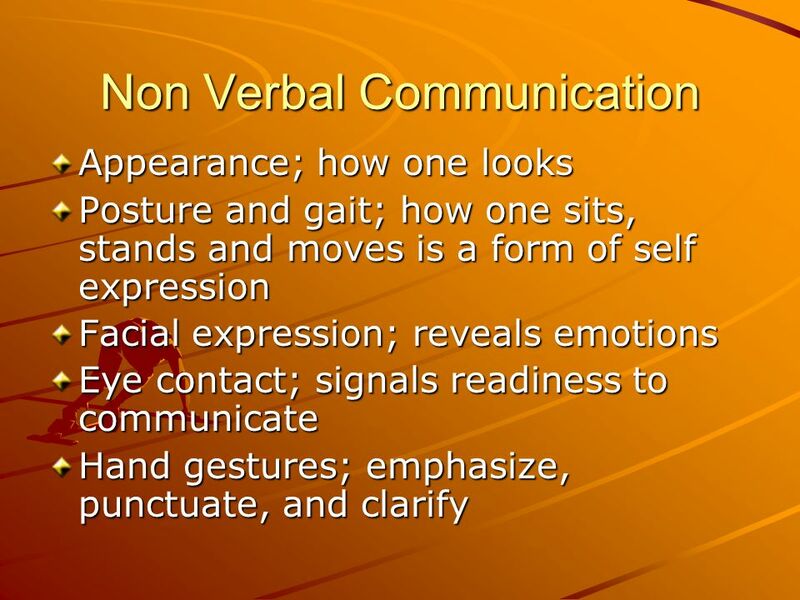 Communicating for Results 9e 5 Key Ideas Defining nonverbal communication Types of nonverbal communication Role of nonverbal symbols Improving nonverbal. Book cover art to be inserted Chapter 11 Building Healthy and Diverse Relationships. Copyright © 2009 Wolters Kluwer Health | Lippincott Williams & Wilkins Chapter 8 Client Teaching. Copyright © 2013, 2009, 2005 by Mosby, an imprint of Elsevier Inc. Chapter 25 Patient Education. TENNESSEE MIGRANT EDUCATION PROGRAM PARENT INVOLVEMENT TRAINING. What does your body say?.  all messages that are not expressed as words. Therapeutic Communication Lecture 1. 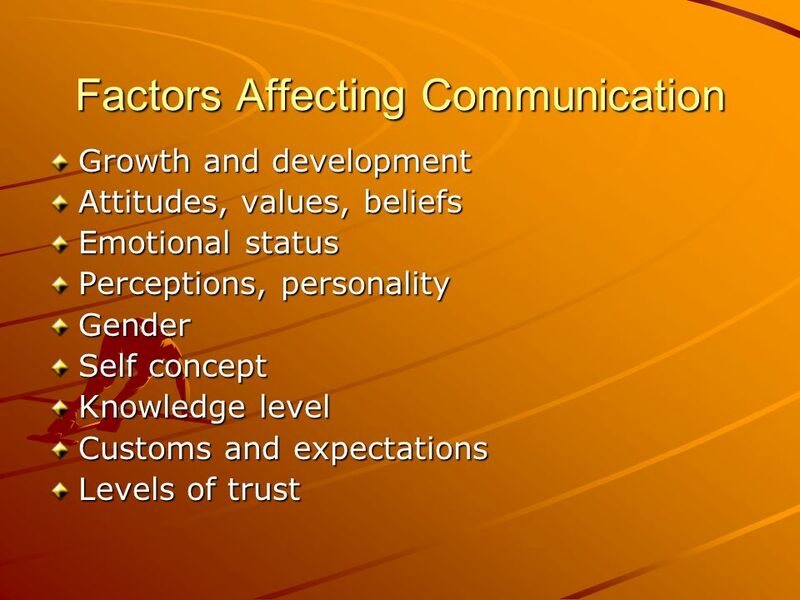 Objective #6 Define communication. Delmar Learning Copyright © 2003 Delmar Learning, a Thomson Learning company Nursing Leadership & Management Patricia Kelly-Heidenthal 0-7668-2508-6.